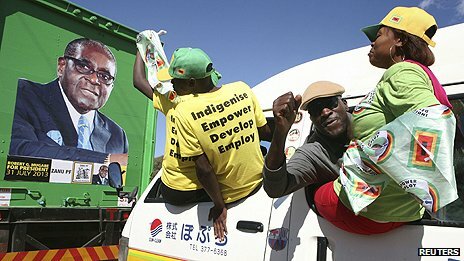 Zimbabweans go to the polls on Wednesday to elect a president and parliament, in an election that will mark the end of the troubled coalition government between veteran President Robert Mugabe and Prime Minister Morgan Tsvangirai. Mr Mugabe, leader of Zanu-PF, is seeking to extend his 33-year rule. His main rival is Mr Tsvangirai, who helped form the Movement for Democratic Change (MDC) in 1999 and has been Mr Mugabe’s only credible challenger at the polls since independence in 1980. The election will be the first to be held under the new constitution approved in a referendum in March this year. Parliamentary elections are to be held on the same day. What happened at the last elections? 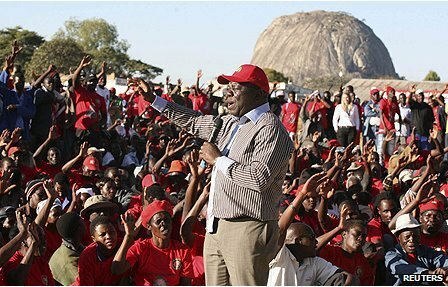 Mr Tsvangirai won the first round of the last presidential elections in 2008 but, according to official results, not enough to win outright. He pulled out of the second round, accusing pro-Mugabe militias of attacking his supporters. Mr Mugabe went on to win the run-off and under international pressure agreed a power-sharing deal with Mr Tsvangirai, who became prime minister. Mr Mugabe has made no secret of his distaste for the arrangement and Mr Tsvangirai has complained of a lack of co-operation in the coalition. There are five presidential candidates, with Mr Mugabe, 89, and Mr Tsvangirai, 61, being the front-runners. The other contenders are Welshman Ncube, the current industry and commerce minister and leader of an MDC breakaway party called MDC-Mutambara; Dumiso Dabengwa, leader of the Zimbabwe African People’s Union (Zapu), a former Zanu-PF rival that merged with it in 1987 but broke away again in 2008, and Kisinoti Munodei Mukwazhe, who represents the small Zimbabwe Development Party (ZDP). Zimbabwe experienced a boom after independence in 1980. But critics accuse Mr Mugabe of ruining one of Africa’s most promising economies by seizing white-owned farms and giving them to landless blacks with little farming experience. Inflation reached an annual rate of 250,000,000% in late 2008. An estimated two million Zimbabweans left to seek work abroad. Since the coalition took over, hyperinflation has ended and the economy at least stabilised at an annual average growth rate of about 5%, largely as a result of a 2009 decision to allow the US dollar and South African rand to circulate instead of the worthless Zimbabwe dollar. But the economic bounce from dollarisation has faded, with growth slowing to 4% last year and only a modest 3% forecast for 2013. Dollarisation has also had downsides, making Zimbabwean exports more expensive and thus keeping growth low by regional standards. According to Tony Hawkins, business professor at the University of Zimbabwe, real incomes are still lower than they were in the 1960s and 25% below their peaks of the mid-1970s and late 1990s. Widespread corruption also remains a sore point, particularly in the crucial diamond export sector. Last November, the campaign group Partnership Africa Canada (PAC) alleged that at least $2bn (£1.3bn) worth of diamonds had been stolen from the Marange mines to the benefit of officials, gem dealers and traders. Zimbabwean mining officials denied the accusation. Where do the parties stand on the economy? Mr Mugabe has said that his Zanu-PF party wants to push through its plans to increase black ownership of the economy, in what is known as its indigenisation programme, and thus promote growth. A 2010 law requires foreign firms to sell a majority stake to local people. Mr Tsvangirai is promising that he will fix the continuing economic problems, clean up corruption, revive industry and attract much-needed investment in order to create jobs. He has also promised to promote transparency in the diamond mining sector. He rejects indigenisation as a political gimmick and tantamount to expropriation. Elections are held every five years by universal adult suffrage. By 23 July, about 6.4 million voters had been registered, according to officials. Zimbabwe has a population of some 13 million, according to the 2013 census. The Zimbabwe Electoral Commission (ZEC) oversees the electoral process and demarcates constituency boundaries. It is headed by Rita Makarau, a former Supreme Court judge. Opposition and rights activists have expressed concern about the transparency of voter registration, the possibility of intimidation and pro-Mugabe bias in the state media. A local campaign group, the Research and Advocacy Unit, claimed in June that the voters’ roll includes a million people who are either dead or have left the country, as well as 116,000 people over the age of 100. ZEC’s deputy chairwoman, Joyce Kazembe, has insisted the vote will “be credible, free and fair”. Mr Mugabe has called for peaceful conduct during and after the elections, and Mr Tsvangirai has also expressed optimism, seeking to allay fears of a repeat of the violence that marred the 2008 polls. However, violence continues to be reported across the country. Will there be election observers? Some observers have voiced concern about the role of the security forces, alleging that Mr Mugabe may be merely a figurehead for powerful generals running the country behind the scenes. 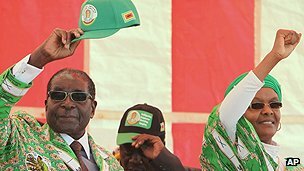 New York-based campaign groups Human Rights Watch said in a recent report that some security chiefs had declared allegiance to Mr Mugabe ahead of the polls, casting doubt on their impartiality. In May, the International Crisis Group think-tank said that the police chiefs “openly support” Zanu-PF and frequently organise the harassment of opposition and independent activists. Radio is the main source of information in Zimbabwe. The state-owned Zimbabwe Broadcasting Corporation (ZBC) has a near monopoly over both radio and television and has a long history of supporting Mr Mugabe and Zanu-PF. Earlier this year the police announced a ban on short-wave radios capable of receiving foreign broadcasts, saying they were being used to communicate “hate speech” ahead of the elections. In addition, broadcasts by overseas-based radio stations transmitting into Zimbabwe, such as the Voice of America’s Studio 7 and UK-based SW Radio Africa, have been jammed. The state-run newspapers are tightly controlled by the Information Ministry. The private press, which is relatively vigorous in its criticism of the government, has come under severe pressure, and cover prices are beyond the reach of many readers. The internet is considered to be nominally free from government interference, but it is relatively expensive and prone to disruption because of power cuts. Zimbabwe has a bicameral parliament consisting of a Senate and a House of Assembly. The 210 members of the House of Assembly are elected by popular vote for a five-year term. In the 2008 parliamentary elections, the MDC won with 51% of votes over Zanu-PF’s 45%.